As you wade through the inky underworld of film noir, it’s hard to find surprises after a while; Where the Sidewalk Ends is one such noir. Dana Andrews and Karl Malden put a spin on the typical noir antiheroes, with Andrews in particular being stuffed with various nuances. Unfortunately, the movie focuses too much on imagery and presenting something bold within the genre that the characters and plot tend to suffer. Gene Tierney appears especially out-of-place considering her history with director Otto Preminger. The worst noir is still a good film, but I wanted this to be better than it ends up being. Detective Mark Dixon (Andrews) is desperate to shake off the mantle of violence left by his father. When Dixon ends up committing a murder and falling for a beautiful woman (Tierney) mixed up with mobsters, the tortured detective must figure out where his loyalties lie. You can spot an Otto Preminger film a mile away, and while this isn’t on par with the superior Laura, it’s worth while for its character interactions. The script, written by the prolific Ben Hecht, coupled with Preminger’s imagery creates a surreal world where horrific violence is taking place amongst classy urban landscapes – a common noir motif. For every illegal dice game, there’s death and destruction happening within, and outside, of it. 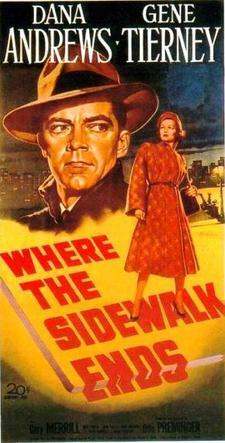 The genre is known for its use of antiheroes (Walter Neff of Double Indemnity still the best archetype); the antiheroes of Where the Sidewalk Ends are firmly anti as cops and detectives rough up people as part of their job. The script stops to explore this cycle of violence through the character of Dixon. When Dixon accidentally kills a man he’s roughed up, it shakes him; cops are heroes, and during the time period were not shy about using their fights to make a point. The men who are beaten are never, ever expected to die! To add insult to the gross injury committed, Dixon learns the man he’s killed is a war hero “with a hatful of medals” and connections to the newspapers. Fate is prominent in noir, and the fates have aligned to bring down Mark Dixon. 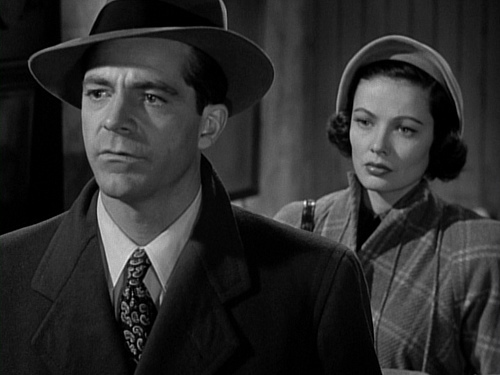 Dana Andrews is usually a comforting presence even when he’s playing scoundrels (case in point, Daisy Kenyon). Mark Dixon is a man torn between the sins of his past and his present, hell-bent on being a different man than his father. Mafia guy Scalise (Gary Merill) warns Dixon that “you’re father liked me.” It’s an inauspicious beginning for Mark who wants to be a good man, but can’t escape getting into trouble. For every bad man he beats, he’s hoping to exorcise his own self-loathing. When Dixon actually commits murder, what does that say about him? It’s a question he grapples with and comes to understand by story’s end. Unfortunately, Mark is a murderer and thus the plot changes into a subplot dovetailing with the main story of illegal gambling, murder, and mafiosos that Mark has been investigating. As Mark delves deeper into bringing down Scalise, he’s also got to remove witnesses who might have seen Mark commit murder; the line between cop and murderer is fuzzily constructed and threatens to disappear. As Mark watches Morgan (Tierney) simultaneously defend and incriminate her husband the intended cold-blooded nature of his father seeps through. The romance between Tierney and Morgan is the element that feels contrived and unsuitable for the film (it’s not a strong mix of romance and mystery like Laura was). While Andrews and Tierney are reunited post-Laura, Tierney isn’t suited for roles that aren’t rich girls. She’s tough, but there’s something missing; Andrews appears to pick up a lot of the slack. Tierney excels at presenting a worldliness and elegance that lends to her vulnerability, while also making her a coveted ray of sunshine within the gloomy noir atmosphere. But the ending has to be happy in some way, and that’s the only reason the romance appears to be included. The happy ending itself doesn’t fit with the air of murder that’s been perpetuated; so when Morgan tells Mark she’ll wait for him – in spite of him killing her husband – it’s a ridiculous way to end things. I also want to throw out love for Karl Malden who is the mad dog personification of righteousness and authority to Andrews’ impetuous murderer. Twilight Time’s new Blu-ray breathtakingly restores the inky blacks of this noir, enhancing the already striking imagery. The bonus content isn’t much – a theatrical trailer, isolated soundtrack and commentary by Eddie Muller. The latter, especially, is worth listening to because Muller certainly knows his stuff, providing a lot of interesting anecdotal information. “A man who hates crooks” is doomed to become one himself; that’s the summary within Where the Sidewalk Ends. Dana Andrews continues to surprise me, and Karl Malden represents all that’s right in the world. As much as I love Gene Tierney, her and the romance are extrinsic to the story, ultimately putting a mushy capper to an otherwise standard noir. You’re absolutely right. This film definitely has its moments, but is not on the level of anything I’d consider a classic. I believe it’s worth seeing once just because it’s a somewhat popular film noir title, and because of the talent associated with the movie. But, as you said, most the people involved have done better things in the genre. Good review!